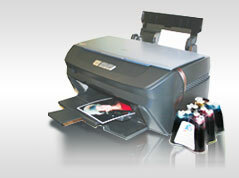 INKSYSTEM – simple, quickly and with small investments open your representation on sale of consumables for printers. Retail clients. Now-a-days printers can be found in almost all homes, lots of them - jet printers. After CISS installation price of print reduces in 20 times, therefore people will tell their acquaintances about this device. Having high - quality goods and powerful advertising support, it will be easy to have new and keep old clients. The person, who has bought CIIS, will constantly buy your ink and photo paper, increasing turns. Photo salons. Those who earns on photo print, know about the quality and the prime price. Such photo studios consume a lot of ink, and photo paper, in the same time advertise CIIS. Service centres of the office equipment, refilling points for cartridges. It is difficult to deal with them , but it is more profitably for work – clients bring printers and ask to help them. They will do turns on CIIS, and all other items. Computer shops. If you want to increase your turns and to receive higher percent of the discount, it is possible with the minimum margin or even without it resell goods in these shops. Then you receive the discount of 40 % faster and increase profit from each sold unit. This variant – for the most ambitious. Offices of the private companies. Even though we usually use laser printers for the black-and-white print, however lots of departments have ink - jet printers for the color print – your potential customers. You can conclude Contracts on complex service and regularly deliver them ink and photo paper. We do not sell directly in those cities where our representations are, contrary, we send entering demands from these regions to our partners. We do not give any special help until our partner has not shown us concrete results in his work. Each representative is protected from a dumping from new players as we rigidly control the same prices for all our representatives in each country.